Dr. Tawni Cashon is originally from Bryan, Ohio where she attended Bryan High School and graduated with honors. She then attended The Ohio State University for her undergraduate studies and received her Bachelor’s of Science in Nutrition. Dr. Cashon then attended The Ohio State University College of Optometry and received her Doctor of Optometry Degree in May 2018. During her undergraduate studies at Ohio State, she was an active member and officer in Delta Delta Delta sorority, worked as an optometric technician and optician for a local private practice, and was a research assistant for The Ohio State University College of Optometry. Dr. Cashon also spent 4 summers as the Head Coach of the Bryan Swim Team where she coached over 100 swimmers each season between the ages of 8-19 years old. During Optometry school, Dr. Cashon served as an officer for the Private Practice Club, Contact Lens Advancement Society, American Optometric Student Association, and Epsilon Psi Epsilon. She was also granted membership into Beta Sigma Kappa and Gold Key, both International Optometric Honor Societies. Dr. Cashon is a member of the American Optometric Association, the Ohio Optometric Association, and The Ohio State Alumni Association. 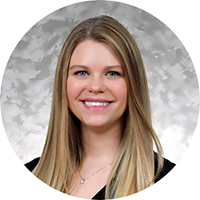 She is excited to practice full scope optometry, diagnosing and treating a variety of ocular disorders and diseases in patients of all ages, but has a special interest in contact lenses and ocular disease. On a personal note, Dr. Cashon and her soon to be husband enjoy spending time with their family, friends, and their dog Archie, cheering on The Ohio State Buckeyes, trying new foods, and exploring Columbus breweries.